The Aesthetics of Composition in Abstract Painting: Minneapolis 5 "Contrast of Temperature"
I just finished another painting in the Minneapolis series. It's a fun piece based on warm colors and the contrast between them. 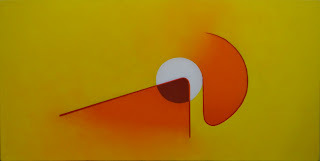 This work will be on exhibit at Regla De Oro Gallery in the spring of 2012. I have been having fun with simple ideas on smaller canvases in preparation for my last BitTorrent oil painting. I hope you enjoy this.